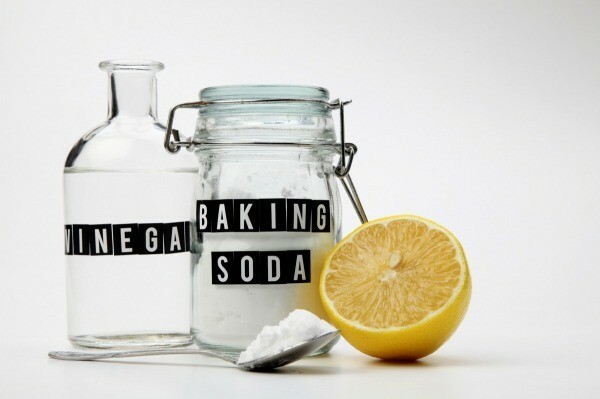 Homemade Drain Cleaners that Are as Efficient as the Chemical Ones! You look at the kitchen sink, and the water isn’t draining away, and your heart sinks at the same time. You’ve got a blockage in the waste pipe and have to clear it somehow. You could reach for a commercial drain unblocker, but they are full of harmful chemicals. The commercial synthetic cleaners often include sulfuric acid or sodium hydroxide. Both of these chemicals can corrode metal or plastic pipework over time. Their only advantage is that they generally work fast. On the other hand, you could raid your kitchen cupboards and come up with non-toxic, natural alternatives that will do the job just as well that are more friendly to the environment. Usually, sink drains get blocked with waste fats and debris that clog together and solidify leaving nowhere for the water to go. So, what we have to do is to get the fats back into a more liquid state so they will pour down the drain and into the sewer. Where to start? Here are our ideas to safely unblock a drain without resorting to harsh toxic chemicals. This might appear to be an obvious move, but lots of people forget the object of unblocking is to make sure any solid fats or grease are liquefied so they can be flushed away as intended. Boil about half a gallon of water in a large pot, and add two or three tablespoons of liquid dishwashing soap. Slowly pour the mixture into the hole until all the water is in the sink. Because you have a large surface area of water in the sink and a much smaller area in the drain, this will also add pressure to the blockage. The weight of the water will be multiplied by the small diameter of the waste pipe. Allow a few minutes for the water and soap mixture to do their job. If the blockage does not drain straight away, you can add more boiling water and soap. The added volume of water will increase the pressure of water in the drain pipe aiding the blockage removal. If the blockage is formed from mostly debris, then the next option might improve your chance of removing it. Often the drain on bathroom sinks and bathtubs get blocked with stray strands of hair that have become trapped. To remove these blockages, it’s a simple job to use a straightened wire coat hanger. Try and get the wire as straight as possible, and still keep the hook on the end. Have an old plastic shopping bag ready for any grunge you pull from the waste pipe. Push the hook of the hanger through the drain hole and into the downpipe. 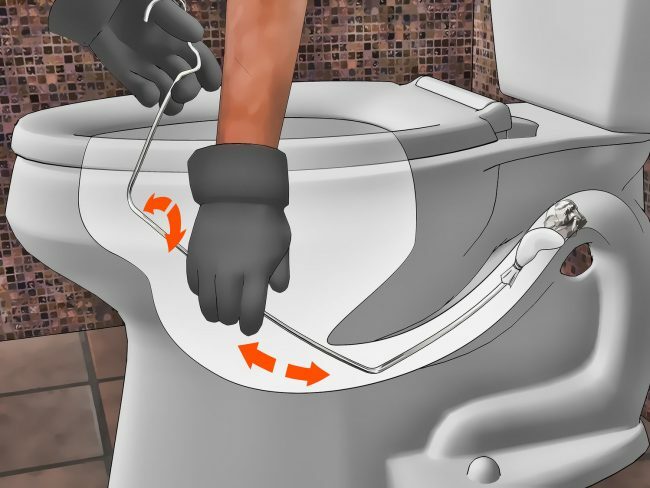 Turn as you go so the open end of the hook can work like an auger as it slides into the drain. When you feel it touching something solid, turn so as to hook the offending mass, and then slowly pull the coat hanger out of the drain, and pop the debris into the shopping bag. Repeat the operation as necessary. Once you think you have cleared all the debris you can, flush the drain with hot water. Before starting this method make sure that all the work surfaces around the sink are clear of kitchen equipment and utensils. 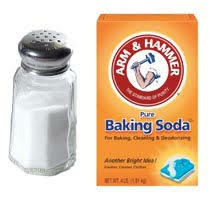 Carefully pour half a cup of baking soda down the drain, followed by half a cup of white vinegar. Quickly plug the drain. A little chemistry at this point explains what is happening. The baking soda reacts with the white vinegar which is an acid to form carbon dioxide and sodium acetate and has a volcano like an effect. The carbon dioxide bubbles scrub the inside of the drain, and because the plug is in the sink hole this volcano of gas is forced down into the drain removing any built-up material in the pipework. After letting the fizzy mixture sit for an hour, take the plug out of the drain, and pour boiling water down it to clear the obstruction. If the drain is not completely cleared after one application, you can try it a second time. 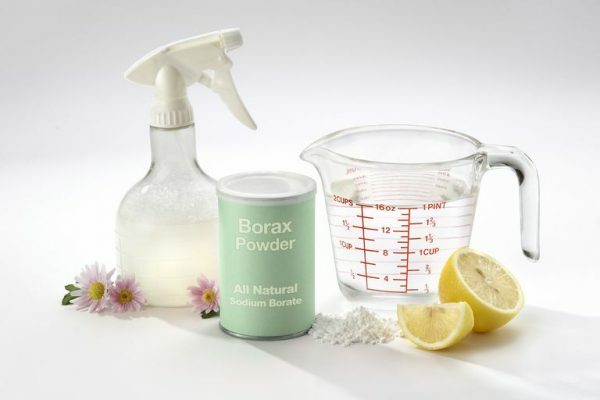 This is a variation on the previous method, replacing baking soda with a 50-50 mixture of borax and salt. The procedure is just the same, with the borax/salt mixture being poured down the drain, followed by an equal quantity of white vinegar. Leave the ingredients to do their work for at least an hour, and then flush with hot water from the tap. The blockage should rinse away with the water. The third variation is to mix equal quantities of salt and baking soda and pour them down the drain. Let the two ingredients sit in the drain for at least 30 minutes, or overnight if possible. After it has had time to work, using boiling water to flush the debris from the blocked drain. There are some simple rules you can follow to reduce the chances of your drain getting blocked. Most importantly is never to put oil or grease down the drain. Other kitchen wastes that should not be put down the sink are banana and potato peelings, bones, eggshells, or the seeds and pits from fruit. If you have a garbage disposal always run cold water through it, and use ice cubes to sharpen the blades. If you want your drain to smell good the peel from citrus fruit such as oranges and lemons will give it a pleasant fragrance. In the bathroom, always fit a hair trap to the sink, tub, and shower.